Proximity is near. The Holidays are around the corner. The Kitchazoic Era is dawning. And better beef est arrivé! Cryptic enough? The Proximity Hotel is near—both chronologically and geographically. This new hotel and its yet to be named restaurant will be built in the next 18 months just a stone’s throw from their sisters. In fact (and we don’t recommend this), if you stood at the O.Henry Hotel’s motor entrance and tossed a stone toward our Lucky 32 restaurant on Westover Terrace, but could only get it halfway there, it would land on the site for the Proximity Hotel! We are hoping you will help us make some important decisions by completing a questionnaire at www.proximityhotel.com/survey. As something like a bribe, we’ll give the 50 most helpful responses a complimentary night’s stay in the first six months that the hotel is open. 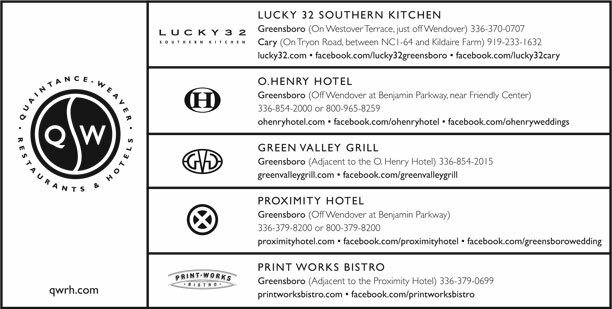 Plus, the ten best will get a Proximity “Package” stay, and the top five will get all that plus a stay at the O.Henry. But wait, there’s more (I hope the Ginzu Knives people don’t have that line copyrighted)… The first-prize winner will receive ten complimentary rooms over the next three years plus all of the other prizes! To state it less flamboyantly, we’d really like your ideas on design details for this new hotel and for some improvements that we’re planning for the O.Henry. Since you know us (and hopefully you enjoy getting news from us), we thought you would give us the best ideas! Survey says…. Thanksgiving Day Dining:While Lucky 32 won’t be open for Thanksgiving Day, we’ll have plenty of turkey at Green Valley Grill. For the first time, you can bring your clan to the Green Valley Grill for Thanksgiving dinner (starting at 4 p.m.)Also, if you want to dine at home, your family can still enjoy Green Valley Grill’s wonderful cooking with Thanksgiving-to-Go. Place your order by 10:00 p.m., Sunday, November 20, then stop by the Green Valley Grill on Thanksgiving Day to pick up your juicy, wood-fired, rotisserie-roasted turkey with all the trimmings, including sides, salads, bread and dessert. To make your reservation or to place your order, contact Green Valley Grill at 336-854-2015 or visit greenvalleygrill.com. Gift Certificates:Our gift certificates are (we say, not so humbly) wonderful holiday gifts. You can order gift certificates for all four Lucky’s, the Green Valley Grill or the O.Henry Hotel by going to qwrh.comor calling our Gift Certificate Hotline at 336-370-0966. We’ll take your credit card number and mail them to you (or to the recipient) promptly. Recipes:If you are looking for ideas for holiday cooking at home, go to lucky32.comand sign up for our luck-E-news. After you sign up, you gain access to our “secret” online recipe book of our 60 most requested recipes from Lucky 32. Group Gatherings at Lucky 32:At each Lucky 32, you can order from our full menu in our private and semi-private dining areas. Plus, we offer reservations, call-ahead seating and a pre-ordering service that expedites service for larger parties. In North Raleighour “Starlight Room” seats up to 32 guests, and in Cary our elegant semi-private dining room seats up to 50. Our Greensboro Lucky’s private dining room seats 8-10, and in Winston-Salem up to 40 guests can enjoy semi-private dining. Call one of our Lucky’s for more information or to make reservations, and visit lucky32.com for our full menus. Get Lucky & Go to a Party!Too busy to prepare that perfect “covered dish?” Let Lucky 32 cook for you. You call, we cook, and we bring your order right to your car. In addition to our current menu, we have larger “party” size portions of some of the favorites and “Family Dinner” options. The “One Stop Wines” are priced low. For complete Get Lucky & Go menus visit lucky32.com. Online Reservations for Green Valley Grill:Now you can conveniently reserve a table online for lunch or dinner during the bustling holiday season, including Christmas Day starting at 4 p.m.Simply go to greenvalleygrill.com. For each reservation, you receive 100 points, and points add up to rewards! And don’t forgot to have your own private wine tasting with one of our flights of wine. Run Away During the Holidays:Escape the hectic pace of the holiday season by running way for a weekend to the O.Henry Hotel.There are plenty of fun events in Greensboro during November and December (see our Top Ten list at ohenryhotel.com). And if you need to do a little shopping, we are right beside the popular Friendly Shopping Center. For our Best Rate, go to ohenryhotel.com. Our best Best Rates are typically on weekends and around the holidays, when you can save up to $50 a night! Send Your Family Away:If you live in the Triad and your house is getting a bit crowded with visitors, send them to the O.Henry Hotel!We will pamper them and make them feel at home. You can use our Social Lobby as an additional living room, and let us do some of the cooking. Remember, go to ohenryhotel.com to get our Best Rate. Group Parties at the O.Henry Hotel:Planning to entertain an intimate gathering of 15 or a big bash of 150 (or something in between)? The O.Henry Hotel’sattentive staff, gracious amenities and elegant banquet facilities will make your party a success. Go to ohenryhotel.com to see photographs of our party spaces and check out the menus. Contact one of our catering consultants at 336-544-9604 orohinfo@ohenryhotel.com for more information. Party at the Office:When you are too busy to leave the office for a group lunch, order our handy boxed lunches from Get Lucky & Go.Just call us before 10 a.m. and you can pick them up between 11 and 11:30. If you would like more than 12 lunches, please give us 24 hours notice. Tour for the Visitors:Looking for a special outing for visitors during the holidays? Bring your holiday visitors for a tour of the O.Henry Hotel. See our beautiful tree in the Cloister Garden and all of our holiday finery while having afternoon tea in the lobby (call ahead for reservations). New Years Day Menu:Make sure that 2006 will be your luckiest year ever and join us at Lucky 32 for New Year’s Day. We’ll feature our full menu plus some special selections. According to folklore, eating greens on New Year’s Day brings paper money, black-eyed peas bring coins, and pork brings good health. The next time you see Jim Slowin, VP of Restaurants, or Wine Director Julia Schiavone, ask them about pump overs, punch downs, and pomace dumping (noble work, this). These are a few of the chores they enjoyed (not) during their first visit to “Crush Week” in Napa Valley in September. This was definitely a working–not a sightseeing–trip. They also cleaned tanks, took spectrometer readings in vineyards to measure sugar levels in grapes, and crushed Syrah and pumped the juice into thousand gallon tanks. Jim and Julia did take a break to attend the annual blessing of the grapes at the Robert Mondavi Winery as the first Sauvignon Blanc was coming in. This was just one step in Julia’s pursuit for more wine expertise. Earlier this year, she attained the Society of Wine Educators “Certified Specialist of Wine” rank and spoke at the North Carolina Wine Growers Association’s Annual Meeting. She was also selected to take the very challenging Court of Master Sommelier’s advanced course in New York. Congratulations, Julia! As we’ve mused in letters past, we are planning some changes for Lucky’s. By April all four Lucky’s will have gone through a beautiful metamorphosis to emerge as “Lucky 32: Kitchen and Wine Bar.” It will be the beginning of her “Kitchazoic Era” — meaning that these restaurants will be even more kitchen (read: food) focused. Plus, if someone called our M.O. kitchy, we wouldn’t deny it! The difference, you ask? Well, let’s talk turkey. We are going to spend more time and effort sourcing and cooking our food. For example, we currently buy top quality roast turkey, like you might find at a high-end deli. Once Lucky’s enters this new era, we’ll buy whole birds that are raised nearby in Chatham County. We’ll cut up our vegetables, plop the bird on them and roast that puppy, showing it some love now and then by basting. Then we’ll carve it for entrees and sandwiches and use the pan goodies for soups and sauces. We’re sure there will be an abundance of happy campers when they bite into these and other new menu selections. We have similar stories about other stuff on our menu. It will be a new era. But, it seems funny to talk too much about what will be news as opposed to what is new, so we’ll leave this at that. Bill Niman, well known and respected in food circles for being a pioneer in naturally grown beef and pork, recently visited all of the Lucky’s locations to teach our staff members about Niman additions to the menu. Come in and enjoy Niman pork, burgers and steaks at all Lucky 32 restaurants and the Green Valley Grill. Niman works with more than 300 independent family farmers (including 30 in North Carolina). Great taste is the goal at Niman Ranch, and they make sure all of the farms treat the animals humanely, raise them on all-natural feeds, and mature them without growth hormones or antibiotics. Four incredible people displaced by Katrina have joined our team. Briana Oesterle will play a leadership role for banquets at the O.Henry and Green Valley Grill. Youssef Mailele (who wins the smile contest) is a member of our porter staff at the O.Henry. Patrick Rossiter will be the Banquet Chef for the Green Valley Grill, and Richard Papier is our newest Sous Chef at the Green Valley Grill. We hope that they all live happily ever after. Brown off ground beef in a soup pot. Add diced meat. When diced meat has cooked to medium, add all spices and cook over medium heat for 20 minutes. Add remaining ingredients except beans. Let simmer for one hour, or until reduced to desired consistency. Add kidney beans and cook for 15 more minutes. ©1989-2005 This recipe is property of Quaintance-Weaver, Inc. Unauthorized commercial use is forbidden. We reserve a limited number of tables at Lucky 32 and Green Valley Grill so that everyone can be accommodated in a reasonable amount of time. Just give a call and make a lunch or dinner reservation. You can also make online reservations for Green Valley Grill at greenvalleygrill.com. When you don’t have a reservation, and you are concerned about waiting, we offer this service. Just “Call Ahead” and we’ll add your name to our waiting list (if we have one) so that any waiting will be kept to a minimum. With larger parties we offer pre-ordering to expedite service so you have more time to enjoy your visit. Let us know when you make a reservation if you would like to pre-order. Just fax us your orders by 10:30 a.m. at lunch and 4:00 p.m. at dinner, and we’ll have your meals served within minutes of arriving. Call the restaurant (or go to the Hours/Reservations section of lucky32.com or greenvalleygrill.com) for a pre-order form. Every so often, the menus at Lucky 32 and Green Valley Grill change to reflect the season. Visit lucky32.com and greenvalleygrill.com for the current menus. For the latest progress reports on the Proximity Hotel, be sure to visit proximityhotel.com.